Details Folded double-sided light box poster. 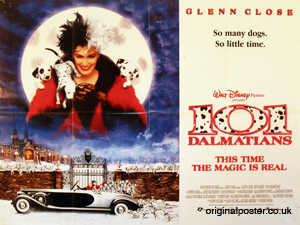 Glenn Close pictured as the over-the-top Cruella De Vil complete with beautiful motor car and incase your counting them in the snow 101 dalmations. Please note this poster has numerous pinholes in the top corners.